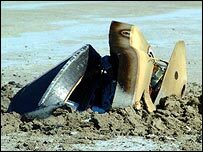 In 2004, photos of NASA’s ruined Genesis probe were a depressing sight, crushed metal shards left half-buried in the Utah desert. Plans for helicopters to intercept the solar probe in midair went amiss because its parachute failed to open. I wrote about this for Trufen.net at the time. Now researchers say there was a (more or less) happy ending to the story after all. The Genesis probe had spent over two years collecting oxygen from the outermost layers of the Sun. Charged atoms from the solar wind were captured on five collecting plates hung outside the spacecraft. About half of the samples were recovered from the wreckage. Researchers were able to remove contamination from them by scrubbing the top 20 nanometers with a beam of cesium ions. Scientists have been able to fulfill the probe’s original mission by measuring the composition of the Sun’s oxygen in a vacuum. This entry was posted in Deep Space 770 and tagged Genesis probe, NASA by Mike Glyer. Bookmark the permalink.